Once Russia had recognized Crimea as an independent country, Russian president Vladimir Putin then argued all that was necessary for his country to absorb the region was a treaty between the two supposedly sovereign states. The unification treaty between Crimea and Russia was signed on Mar. 18, the day after the peninsula's declaration of independence. The treaty went into full effect on Mar. 21 after it was ratified by both houses of the Russian parliament and formally signed into law by Putin. See Also: Crimea Declares Independence: Is It Really a Country? Besides those country-level changes, there has also been an adjustment to the subnational administrative status of Crimea. Ukraine's Autonomous Republic of Crimea and the special municipality of Sevastopol, which united to claim independence as the Republic of Crimea, have now been separated again as divisions within the Russian Federation. 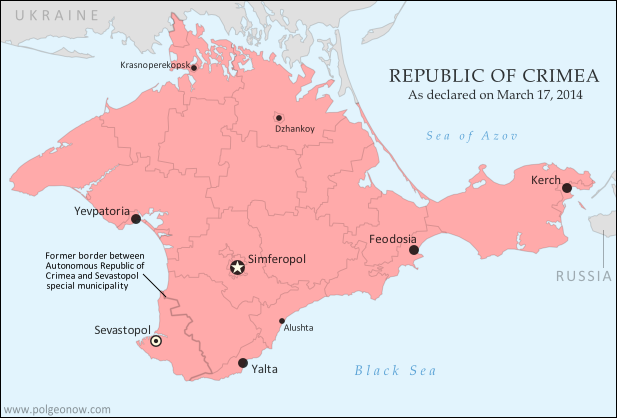 The former Autonomous Republic of Crimea is now the Republic of Crimea, a federal subject of Russia, and Sevastopol is a "city of federal significance" (also a type of federal subject within the Russian Federation). Russia's annexation of Crimea may look complete on paper, but changing the whole region from Ukrainian to Russian administration is going to be a major logistical headache. In addition to the issues of distributing Russian citizenship to all Crimeans and figuring out what to do with members of the Ukrainian military who are stationed there, infrastructure will be a major issue. Crimea has no land link to the rest of Russia, so new bridges and pipelines will need to be built if the region isn't going to remain heavily dependent on Ukraine. There will also be a major stir-up to the communications system as telephone area codes are completely replaced to fit into Russia's system. An extra digit will also need to be added to postal codes, and clocks will be permanently set two hours forward this Sunday to switch to the same time zone as Moscow. Graphic of the Crimean flag is in the public domain (source).